The Grand Parade was led by Peter Powell the Town Crier and the Mayor of Warrington. 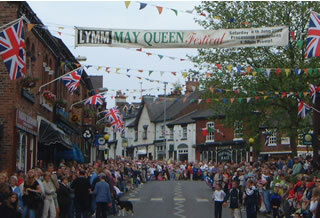 The village looked splendid with an array of flags, bunting and cheering crowds. This year's May Queen is Sarah Eadon and Miss Rosebud is Louissa Bannister. Daniella Clarke and Tara Livesey presented their crowns to the Lymm May Queen and Rosebud elect.The crowds enjoyed the music provided by the Warrington Brass Band, Latchford Silver Band, Warrington Juvenile Pipe Band, Bootle Concertina Band, Lymm's Samba Band and the Bulls Hitters raising cheers from the crowd. The May Queen Field had many stalls and activities including May Pole dancing and slapstick comedy with Tom and Tilly Turnip. Many thanks to the organisational committee, community helpers and the police.